It’s a real pleasure to be joining in with Cathy and other bloggers today to celebrate five years of In a Vase on Monday. Do click on the link to see what she and others have come up with to rise to her challenge of (Not) In a Vase. 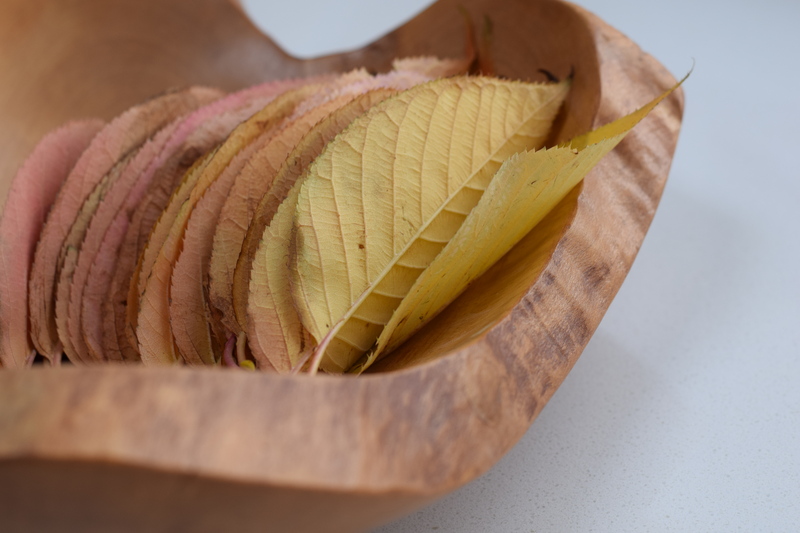 I’ve used a sculpted wooden bowl – a polished piece of rhododendron bought at the Lost Gardens of Heligan in Cornwall about 15 years ago – and some of the beautiful burnished cherry leaves that are currently scattered all over our back lawn. They have such glowing colours that I couldn’t leave them out there to all turn to mush in the heavy rain we keep having. I’d like to say a heartfelt ‘thank you’ to Cathy for hosting IAVOM and for keeping it going so brilliantly over the years. It’s a lovely thing to join in with on a Monday when I have the time and has really rekindled my love of flower ‘arranging’ (that’s in inverted commas because I go by instinct rather than proper arranging techniques) and of photography. I’ve started growing flowers specifically for cutting which brings such pleasure and I’ve discovered that one of my most favourite things to do is to stick some flowers in a jug and take photographs of them. I’d especially like to thank her for all her encouragement and kind comments on my blog over the years. Here’s to many more Mondays of flower, grass, leaf or whatever faffing! 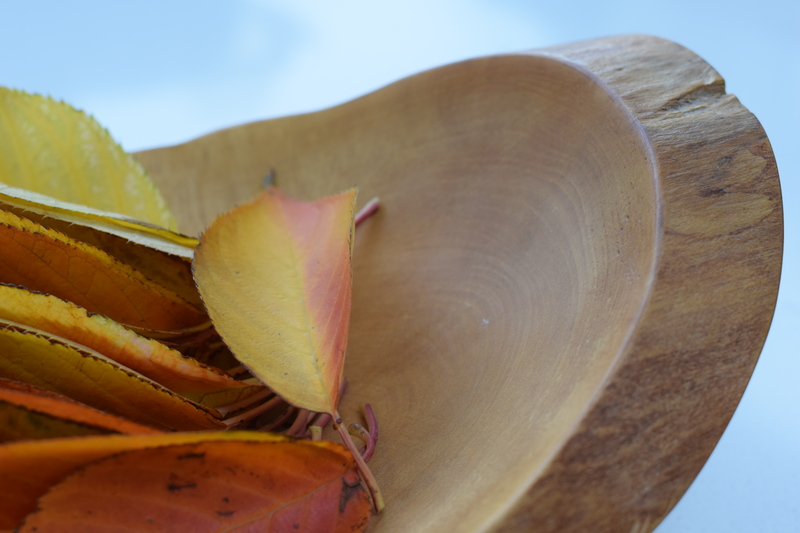 I love the bowl Sam and how anazing that it is made of rhodendron. 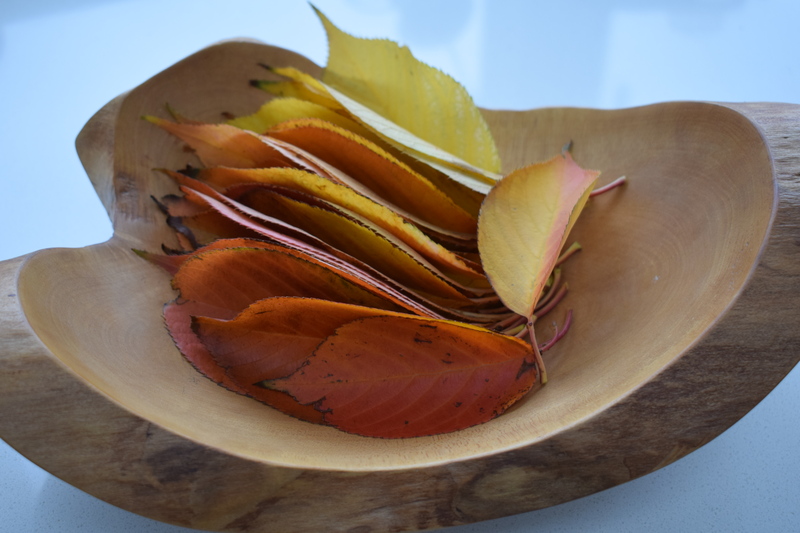 A lovely way to display autumn leaves. I always pick a few of the most colourful up and then I don’t know what to do with them. Thank you, Cathy 😊 We recently rediscovered the bowl and it’s lovely to be able to use it here. Marvellous! How can I join in? You post on your blog and link to Cathy’s blog – it’s a lovely community. Hope you join us. Thanks so much, Amanda. I’ll pop over to yours later. Hey, I think this is my favorite, not because the others lack in any way, but because I like autumn leaves so much. That’s very kind of you to say, Tony. I love leaves too, especially colourful autumn ones. This is so classy Sam! Fantastic. 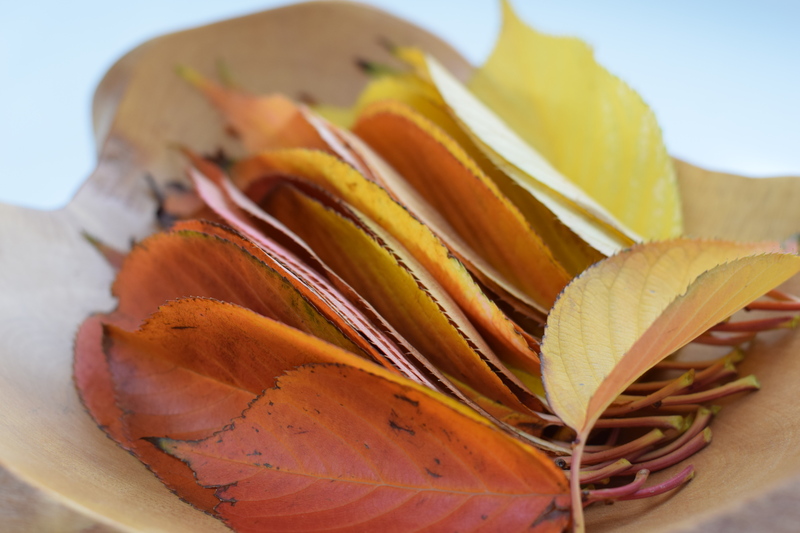 Cherry leaves in autumn colours are wonderful. Oh, aren’t they gorgeous and so beautiful in the bowl. I’ll have to go and line some up now. 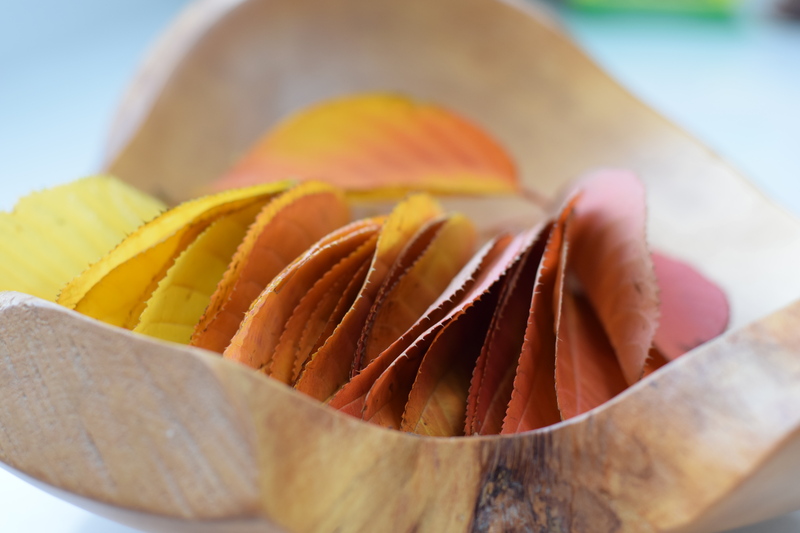 A wonderful way to display these pretty leaves! Very clever and beautiful! Arranged like a color wheel ! This is wonderful, Sam, and the sculpted bowl is just perfect. 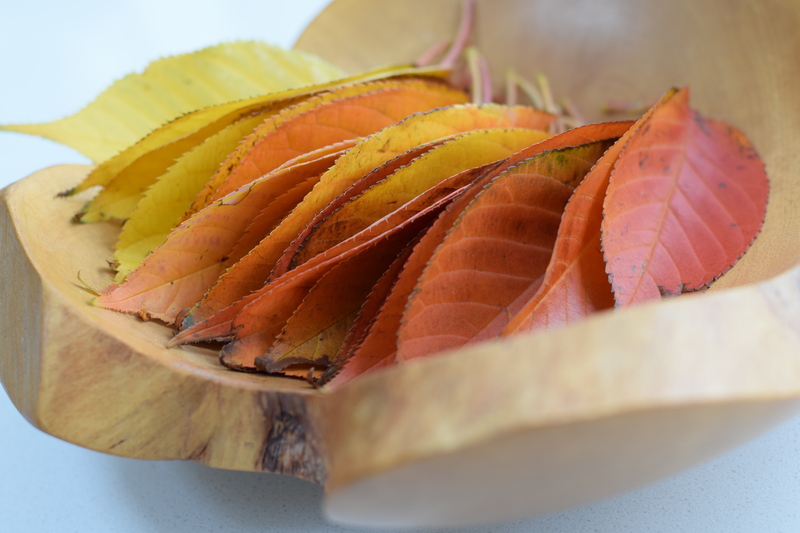 I absolutely love the bowl and those stunning autumn cherry leaves were perfect! Really outstanding not a vase! These are such lovely images. They remind me of an Andy Goldsworthy project. Beautiful – they look a bit like artisan crisps! Lovely presentation Sam! Happy IAVOM. What a great idea! I love how you present the fall leaves.